Guest post from staffer Victoria Hassid, who spent the weekend in Eureka preparing for Jerry's sixth stop on his statewide tour. Thanks to everyone who came out to our events and helped make Jerry's final campaign push a huge success! But costumes, parties and trick or treating were far from my mind this weekend as I hunkered down in Humboldt County for three days with colleague Sarah in preparation for Jerry’s visit as part of his 12-city statewide blitz. Neither Sarah nor I had ever been to Eureka, let alone advanced an event for Jerry completely on our own. We were excited, nervous and unsure what to expect. No amount of experience, however, could have prepared me for the energy, passion and excitement Humboldt County holds for Jerry. From the minute we hit the ground, we were met with open arms as people from all over both Humboldt County and northern Del Norte County gathered to help give Jerry a warm welcome. 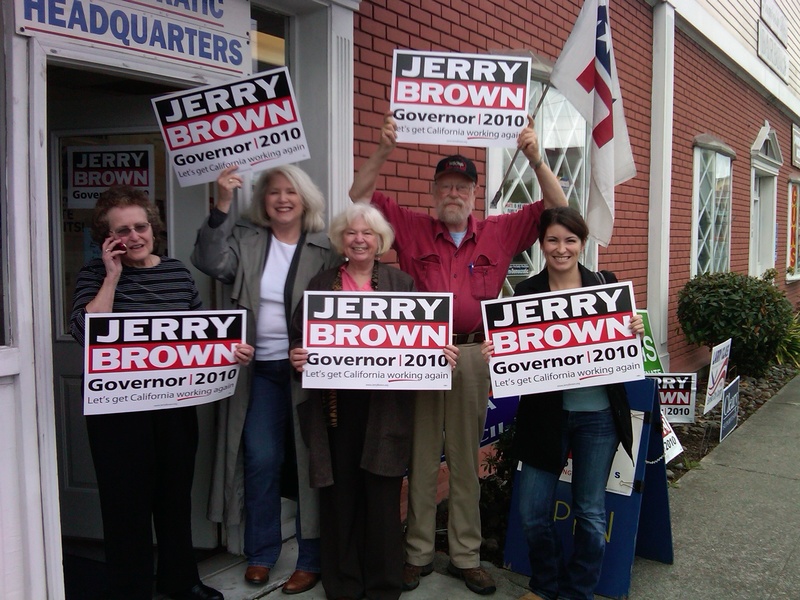 We drove up and down 101, meeting volunteers eager to donate their time, money, and resources to make sure Jerry felt the love. Supporters started lining up in the dark at 6 am Sunday morning outside the historic Samoa Cookhouse, the longest continuously running, (and last surviving) logger chowhouse. As locals from across the area, some as far as two hours north, filled the restaurant, wafts of syrup, sausage and French toast began filling the air. The anticipation was high as everyone waited for Jerry’s arrival; the energy palpable. As soon as our candidate walked in, everyone immediately stood to their feet. The crowd was electric. Before long, Jerry hopped on a small riser, surrounded by supporters. The crowd hung onto his every word. While joking that he “wasn’t quite awake yet,” he easily discussed his California roots, his love for the North Coast, and why we still needed to move forward on thoughtful environmental policy—a fact hardly lost amidst the one of California’s most gorgeous stretches of coastline. Our weekend in Eureka combined with Jerry’s remarks reminded me yet again why this election is so important. All weekend, we met people who will rely on our next governor for jobs, to save our environment, to get our state back on track. We all know that only Jerry can get this done. And while he reminded us that we have tough decisions ahead, that it will not always be easy, he also gave us hope. Hope that California’s recent struggles would serve to provide lessons on how we can strengthen our state and make us better than ever. Unlike some other candidates I know, Jerry isn’t trying to make us the next Texas or Colorado. We don’t need to try and be some other state. A lifelong Californian himself, Jerry knows California is the best state. And the rest of us, we who have spent all or part of our lives here, agree. As our next Governor, Jerry will focus on what makes us strong, shaping our state into the land of possibility and innovation it’s always been. As Jerry jetted off to the airport towards his next stop in Chico, Sarah and I joined hundreds of local supporters to wave him goodbye. I felt inspired in a way I so rarely do these days. Love, optimism, and pride washed over me as I was reminded, yet again, about why I can’t wait for Jerry Brown to lead California. Victoria (right) joins fellow supporters at the Eureka Democratic Headquarters.